Tropical cyclones and East Coast Lows are projected to become less frequent as a result of climate change but those tropical cyclones that do occur are expected to be more intense, and may track further south. The most important damaging windstorms that affect Australia are tropical cyclones and East Coast Lows. Tropical cyclones occur over the northern half of the country, north of Exmouth in the west, and north of Rockhampton in the east and occasionally further south. The cyclone season runs from November to April. On average, Australia experiences 11 tropical cyclones per year, of which 4 make landfall. Projections of tropical cyclones suggest that the number per year may decrease by 2100 as a result of climate change, while the intensity of those tropical cyclones that do occur is expected to increase. Tropical cyclones may track further south. Southern Queensland, New South Wales and eastern Victoria are affected by extratropical cyclones known as East Coast Lows (ECLs). These can occur at any time, but are most common in autumn and winter. On average there are 10 ECLs per year, but only one develops to the stage of causing damage. The frequency of ECLs is expected to decrease as a result of climate change. Intense tropical cyclones and ECLs are associated with strong winds, heavy rainfall and storm surge causing damage to ecosystems, property and infrastructure, and loss of life. The impacts are greatest in low-lying coastal areas. Any intensification of storms in the future will increase these risks. Tropical cyclones are intense low-pressure storms that develop over warm ocean waters (temperatures greater than 26.5°C) with sustained gale force winds of at least 63 km/h. Their intensity is described in terms of categories ranging from 1 (weakest) to 5 (strongest), related to the maximum mean wind speed (Table 1). Table 1: Tropical cyclone severity categories. Source: Adapted from Bureau of Meteorology (BoM) website http://www.bom.gov.au/cyclone/about/ (accessed 1 April 2016). The Bureau of Meteorology has developed a video to help explain the different tropical cyclone categories: http://www.bom.gov.au/cyclone/about/intensity.shtml (accessed 1 April 2016). Where and when do tropical cyclones occur? Australia is one of the most cyclone-prone areas of the world, especially the northern coastal region of Western Australia. Tropical cyclones occur mainly between November and April over the northern half of the country, north of Exmouth in the west, and north of Rockhampton in the east. Generally they last for several days, following a track that typically has a west to east component. Once their track passes over land, and they are removed from their source of water and energy, they die out. Figure 1: Tropical cyclones in Australia between 1996 and 2006 Source: © Commonwealth of Australia 2016, Bureau of Meteorology http://www.bom.gov.au/cgi-bin/silo/cyclones.cgi (accessed 1 April 2016). For the last two decades, Australia has experienced 11 tropical cyclones on average each year (Dowdy 2014), of which 4 have crossed the coast. 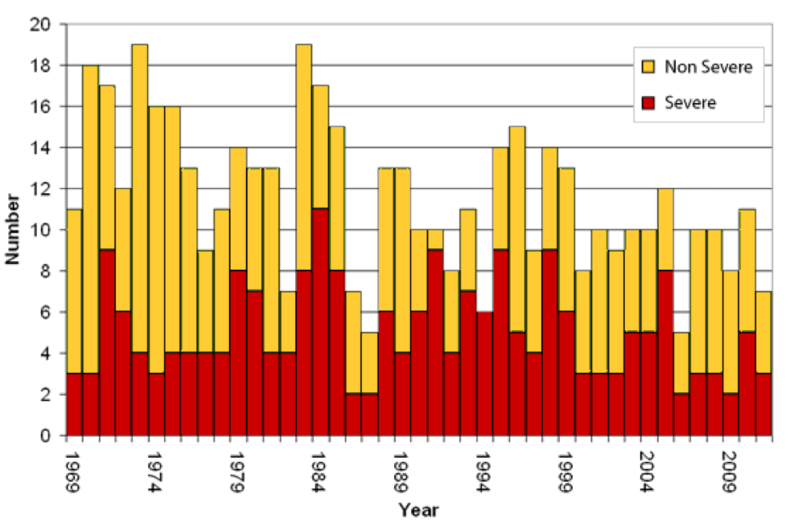 Over time, the total number of cyclones appears to have decreased to the mid-1980s and since then has remained nearly stable (Figure 2). There is no long term trend in the number of severe tropical cyclones (with minimum central pressure less than 970 hPa). El Niño events, when the east-west atmospheric circulation in the equatorial Pacific is weak, and La Niña years, when the east-west circulation is strong, influence the number of tropical cyclones. Changes in wind patterns and water temperatures result in fewer tropical cyclones crossing the coast during El Niño years, and more during La Niña years. Figure 2: Time series of tropical cyclones from 1970 – 2011 in the Australian region. Source: © Commonwealth of Australia 2016, Bureau of Meteorology http://www.bom.gov.au/cyclone/climatology/trends.shtml (accessed 1 April 2016). Severe storms can occur anywhere in Australia and do so more frequently than any other major natural hazard. They can cause great impacts as a result of the destructive winds, heavy rainfall and large hail that they can produce. Of particular interest are the East Coast Lows (ECLs) that affect the eastern coast of Australia (southern Queensland, New South Wales and eastern Victoria). These low-pressure systems have much shorter lifetimes than tropical cyclones, typically one to two days, but can occur any time of the year, being more common between May and August. ECLs can develop and intensify rapidly overnight making them dangerous and very difficult to predict. This was the case with the Pasha Bulker storm (2007); a series of five ECLs that impacted the coasts of Newcastle during June 2007 and resulted in wind damage and widespread flooding, coastal erosion, the grounding of the Pasha Bulker (a 40,000 tonne bulk carrier ship) on Nobbys Beach, and the loss of nine lives. ECLs can cause large amounts of rainfall and make an important contribution to water resources. What will be the effects of climate change on windstorms? Climate projections suggest that the number of tropical cyclones per year may decrease by 2100 as a result of climate change, while the intensity of those tropical cyclones that do occur is expected to increase. Tropical cyclones may track further south. Projections also indicate that the frequency of ECLs may also decrease over the coming century. What are the risks associated with tropical cyclones and East Coast Lows? The main risks with tropical cyclones and ECLs are strong winds, heavy rainfall, rough seas and storm surge. Severe winds: Wind gusts near the centre of tropical cyclones can exceed 180 km/h. ECLs generally have lower wind speeds but a gust of 165 km/h was recorded at Newcastle in 1974 during a storm that sank the bulk carrier named Sygna. Such violent winds can cause extensive property damage and turn airborne debris into potentially lethal missiles. Heavy rainfall: Some of Australia's heaviest rainfalls have occurred in association with tropical cyclones and East Coast Lows. The maximum rainfall recorded during a Western Australian cyclone was 927 mm in 36 hours at Whim Creek in 1898 (BoM 2016). Rain can lead to flooding and landslides. Events where wind damages the structure and allows rain to penetrate can result in severe property and contents damage to houses. Flooding can affect vast areas, inundating land, isolating communities and destroying infrastructure. Storm surge + high tide: Storm surge is a sudden rise of water (about two to five metres higher than the normal tide level) caused by onshore winds and atmospheric pressure changes in the ocean’s surface. It can extend many tens of kilometres from the storm centre and has the potential to cause extensive coastal inundation, as well as damage to port structures and ships in harbour. 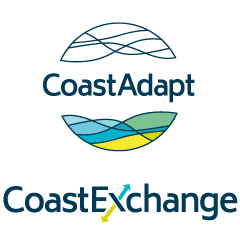 If the surge occurs at the same time as a high tide then the area inundated can be extensive, particularly along low-lying coastlines. High waves can also exacerbate flooding. These events are expected to become more damaging and extensive as a result of rising sea levels (see Global climate change for more information). Figure 3: Cyclone storm surge. Source: © The State of Queensland 2016 http://www.bom.gov.au/cyclone/about/ (accessed 1 April 2016). What are the impacts of windstorms? People: Loss of life can occur during windstorms, especially tropical cyclones, and in the past these numbers have been very high (e.g. 300 people died in Bathurst Bay, Queensland during cyclone Mahina in 1899). Cyclone-related flood events can cause death by drowning, while strong winds have the potential to kill and generate injuries due to falling masonry and flying debris. However, deaths associated with tropical cyclones have drastically decreased in the last years. For example, no direct deaths were reported as a result of severe tropical cyclone Yasi (2011), even though it was described as one of the most intense cyclones in Australia’s recent history. Infrastructure: Damage to buildings and infrastructure can result from the impact of wind and water, or through objects the wind propels. Loss of roof cladding, wall cladding, windows and doors is common. This was the case with category 4 cyclone Tracy, which made landfall at Darwin in 1974. The storm left 94% of housing uninhabitable and approximately 40,000 people homeless. Ecosystems: The impacts of storms on coral reef ecosystems are well documented. As much as 34% of the coral mortality recorded between 1995 and 2009 in the Great Barrier Reef (GBR) has been attributed to severe storms (Osborne et al. 2011). Cyclone Yasi (2011) was responsible for one of the greatest losses of cover in recent years, damaging almost 15% of the entire GBR Marine Park (Beeden et al. 2015). Rainforest ecosystems are also regularly affected by storms. What can we do in terms of adaptation? Australian communities have learned lessons from windstorms events, and there is evidence of successful adaptation. For example, the devastating impacts of cyclone Tracy (1974) led to modifications to the building codes, and development of world-leading, wind-resistant design and construction practices in Australia (Mason and Haynes 2010). However, indications that tropical cyclones may become more intense in future, and track further south, suggest a need for further adaptations. Australia has extensive experience in managing emergencies. Some critical areas in handling an emergency include the following areas. Communication: it is important to ensure that all affected residents can access the emergency information before, during and after an extreme event. Warnings: Establishing a media plan prior to an event to ensure that warnings are taken seriously without inciting over-reaction among the affected community. Power: stand-by generators should be in place and well maintained, in case of power outages. Community: support for asssistance to be provided locally so that families and communities are kept together. Each state and territory runs its own emergency management agency, all with different approaches to coordination and management. What is clear for all, however, is that emergency services cannot reach all of the people all of the time. Therefore it is important to build preparedness and resilience at the community and individual level. Beeden, R., J. Maynard, M. Puotinen, P. Marshall, J. Dryden, J. Goldberg, and G. Williams, 2015: Impacts and recovery from severe Tropical Cyclone Yasi on the Great Barrier Reef. PLoS One, 10(4). Accessed 1 April 2016. [Available online at http://ro.uow.edu.au/cgi/viewcontent.cgi?article=4146&context=smhpapers]. Bureau of Meteorology (BoM), 2016. About tropical cyclones. Accessed 1 April 2016. [Available online at http://www.bom.gov.au/cyclone/about/]. Dowdy, A. J., 2014: Long‐term changes in Australian tropical cyclone numbers. Atmospheric Science Letters, 15(4), 292-298. Mason, M. and K. Haynes, 2010: Adaptation Lessons from Cyclone Tracy. Gold Coast: National Climate Change Adaptation Research Facility. Accessed 1 April 2016. [Available online at https://www.nccarf.edu.au/publications/adaptation-lessons-cyclone-tracy]. Osborne, K., A.M. Dolman, S.C. Burgess, and K.A. Johns, 2011: Disturbance and the dynamics of coral cover on the Great Barrier Reef (1995–2009). PloS one, 6(3), e17516. Accessed 1 April 2016. [Available online at http://www.ncbi.nlm.nih.gov/pmc/articles/PMC3053361/].